Whatever history says of the still controversial resignation of Pope Benedict XVI, history itself is not the ultimate judge of a man. 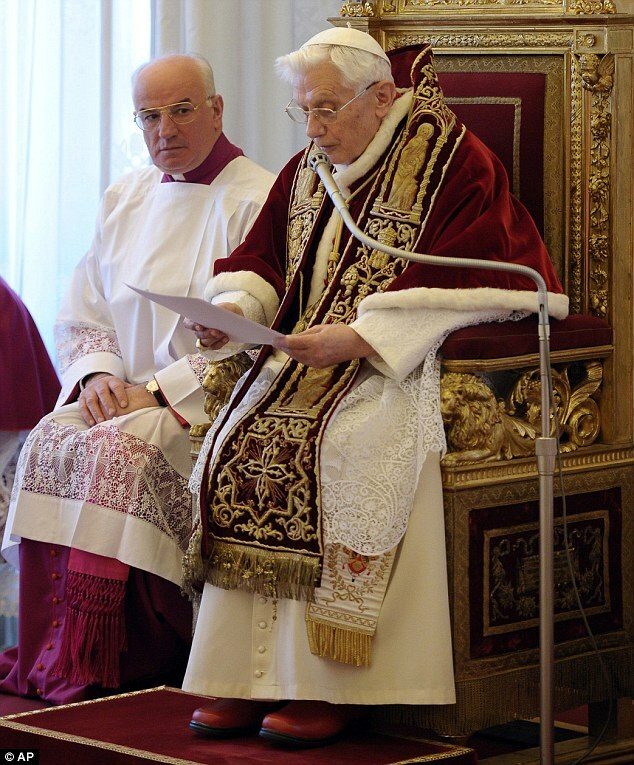 The judge of every man is Our Lord Jesus Christ, Whose Vicar on Earth, Benedict XVI was. I say 'was' because, like the vast majority of Catholics, I assume that this title now belongs to his Successor, Pope Francis. On a macro-scale, the Catholic Church has been thrown into a crisis of perhaps hitherto unprecedented proportions. So much has changed, most notably, in the public image of the Pope and the Church. The man who Austen Ivereigh dubs, 'The Great Reformer', Pope Francis, has expended huge amounts of energy in cultivating an image of the Catholic Church which is astonishingly human, so human that it is not an exaggeration to argue that we could be forgiven for thinking that under the reforming Pope of our current times, the Catholic Church is experiencing, on a general scale, a cultural revolution of secularisation effected through an engineered collapse of the Church's fundamental tenets of belief. Quite simply, Pope Francis is, in terms of the message going out to the city and the world, for the Catholic Church, our 9/11. Whatever is knocked down can, however, be rebuilt. And while it cannot be exaggerated just how very damaging this cultural revolution - effected from above, mostly, though not totally, through public relations - is, precisely because it comes from the summit of the Church, what Bishop Athanasius Schneider and Cardinal Raymond Burke have called a 'crisis' is, in my opinion, like Lent and Passiontide, only a prelude to, a preparation for, the birth-pangs of, something else entirely. For what we look forward to in Lent is not simply an ecclesiastical event but the Resurrection of Christ our Lord and ultimately, the Resurrection of the Dead, the Resurrection of the Church, the Bride of Christ. What is needed is a fully comprehensive dissection of everything that Pope Francis has actually said and done that is questionable in the light of the truth handed down to us and particularly where he has, or has appeared to have, contradicted the firm teaching of earlier Popes and/or the Catechism. This questionnaire should be sent to the Pope asking for answers, and copied to every Bishop in the world, with a request signed by every faithful Catholic, for a detailed response on each point. E.g. "Holy Father, did you tell the atheist, Eugenio Scalfari that his soul would be annihilated at death, if not, please provide your assurance that this was never said by you, but if so, please explain how this can possibly be reconciled with the consistent teaching of the Church that there are ultimately only two fates for a human soul, heaven or hell?" "The Vatican has prepared three alternative endings for the priest's words of dismissal at Mass, to emphasize the missionary spirit of the liturgy. Pope Benedict XVI personally chose the three options from suggestions presented to him after a two-year study, Cardinal Francis Arinze told the Synod of Bishops in mid-October. The Vatican newspaper, L'Osservatore Romano, published an interview Oct. 17 with Cardinal Arinze, head of the Congregation for Divine Worship and the Sacraments. --Ite ad Evangelium Domini annuntiandum (Go and announce the Gospel of the Lord). --Ite in pace, glorificando vita vestra Dominum (Go in peace, glorifying the Lord by your life). --Ite in pace (Go in peace)." Bergoglio remains an "unswerving ideological opponent of the Pope Emeritus." But is he? Thomas Droleskey's 'No Space Between' them - http://www.amazon.com/No-Space-Between-Ratzinger-Bergoglio/dp/1506185533, is a thorough comparison of these two Novus Ordites. "One of the most absurd developments in the past nearly nine years now is the extent to which former critics of Joseph "Cardinal" Ratzinger attempted to transform him into a veritable "restorer of Tradition" once he, as "Benedict XVI," had met at Castel Gandolfo with Bishop Bernard Fellay, the Superior General of the Society of Saint Pius X, on August 29, 2005, the Feast of the Beheading of Saint John the Baptist, and especially after the issuance of Summorum Pontificum on July 7, 2007...The effort to transform a man who was termed by one prominent "resist while recognize" movement writer (Chris Ferrara) an "ecclesial termite" and mocked as "our only friend in the Vatican" into an opponent of the very conciliar revolution he helped to design and impose upon the "Second" Vatican Council is beneath contempt as it was nothing other than a supposedly "strategic" exercise in intellectual dishonesty designed to keep traditionally-minded Catholics from examining the truthfulness of the following statement of the late Mario Francesco "Cardinal" Pompedda in February of 2005: It is true that the canonical doctrine states that the see would be vacant in the case of heresy. ... But in regard to all else, I think what is applicable is what judgment regulates human acts. And the act of will, namely a resignation or capacity to govern or not govern, is a human act. (Cardinal Says Pope Could Govern Even If Unable to Speak, Zenit, February 8, 2005; see also see also Gregorius's The Chair is Still Empty.) The effort to transform the one-time "ecclesial termite" into a "restorer of Tradition" and, at the present time, into a supposed counterpoint to the allegedly more "progressive" Jorge Mario Bergoglio has had to overlook the now retired "pontiff's" expressly stated desire to use Summorum Pontificum as a means of "pacifying the spirits" of those who were "attached" to the 1961/1962 Missal that had been promulgated by Angelo Roncalli/John XXIII and was in effect in the counterfeit church of conciliarism for precisely three years before being replaced by Giovanni Montini/Paul VI's Ordo Missae on Sunday, November 29, 1964..."
Prompted by the Holy Spirit, Benedict's decision to resign was wise and prudent. It is the same Spirit who animated the election of his successor. With humble and contrite hearts, Benedict certainly knew his limitations and Francis clearly knows his. In response to his many requests for prayer, an edifying and spirit-filled litany for the Holy Father can be found at http://www.newliturgicalmovement.org/2015/09/a-litany-for-holy-father. @Anon (ps the above 'Bergoglio remains an "unswerving ideological opponent of the Pope Emeritus." But is he?" Was not meant to be anonymous. Gosh. You seem to know the soul of Ratzinger with a God-like prescience. The 'entitlement' with which the Novus Ordite/Protestant lays claims on the Holy Ghost is uniquely un-Catholic. The Holy See - disparaged and deliberately 'misunderstood' by two generations of Novus Ordo presiders and their followers have a few centuries to catch up with Luther et al. Good effort with the Russians though, no? Stands a better chance of getting the Lefebvrists back too. He takes risks this fella amid the soggy liberal dross. Credit where it's due, old boy. I cannot understand nor accept the resignation of Pope Benedict XVl. Was this God's will? If so why would God give us a different man to lead us that at one time would have been subject to an investigation by the Congregation for the Doctrine of the Faith. Anthony: Not anthony blunt by any chance? Good job w/the "russians"? The Blessed Virgin asked for Russia to be consecrated to the Immaculate Heart. Instead, bergie meets in Cuba (where Catholics are being bludgeoned and imprisoned) w/some commie KGB agent who wears $30,000 watches. Does he say anything to Krill about givin money to the poor (like one of your watches!)? Does he say anything to Raul (Castro) about not mistreating Catholics (what about their religious liberty)? No! But he signs some lying filthy piece of paper that's not worth the tree that was cut down (oh no a tree cut down what about the climate?) and you, Anthony, say "good job"! Good job for what? Not Jesus Christ. Guess for rich fat liars profiting off the poor (sounds like Satan). Fernando, why were we given the Borgias, God's will? How do you know if Benedict was prompted by the Holy Ghost? Benedict did good things. But objectively speaking he has probably done more to diminish our understanding of what being the Successor of Peter means. He should not have resigned. I know two or three people who are at least as aged etc., as he is, but would not dream of giving up. The papacy is now, it would seem, just a job which you can take up, or walk away from when it suits you. Since I no longer believe in the validity of any of the conciliar popes, I am not disturbed or surprised by this prospect. Jacobi, in his resignation statement Benedict refers to his repeated examinations of conscience before God; i.e. God the Father, Son and Holy Ghost. Whatever you can tell about it, for me it was and is a big pain, I think Francis is a Bishop among many other Bishops, doing the job he was elected for, waiting for Lord's mercy. Amen. So what. That in no way tells either Benedict or you or I if the Holy Ghost intervened in any way. Did the Holy Ghost urge him to resign and so damage the Papacy? 'Damage' has to a greater or lesser degree has been inflicted on the papacy from within and without throughout Church History. I trust the Holy Ghost/Spirit is guiding the barque of Peter. There rests my case. I see things as the One Holy Catholic and Apostolic Church does. As a Catholic I can not see things otherwise. How do you know who" fired" Benedict. Evidence please. I thought it was the Holy Ghost?. That is assuming you are the same "Anonymous"? And as for "idiots", you are not starting what I call the slide, I trust? No, I'm not the same Anonymous, have ever heard about the Skt.Gallen mafia? Idiots or memes,it makes no difference. God bless. I haven't, but as you say it makes no difference. Whatever the pressures and whoever from, he personally chose to resign. That was a bad decision.